Hello is like the beginning of everything. It can be the beginning of a friendship, a relationship, a job. Hello is the start. It is the foundation to build from. Hello can mean a million different things. Hello is 5 simple letters that could define your destiny. Hello is one of the most powerful words in the english language but how often do you think about it’s importance? We go through life thinking, living and dreaming yet sometimes we overlook some of the most simple things. I might be weird but sometimes I see people going about their lives and I am drawn to them. I want to know their story I want to know where they’ve come from, where they’re going and what they’re doing. Not to be nosey but I feel every person on this planet experiences a life so different to the life that we are living. They have so many experiences in their own life that I may never get to experience. I can learn from that person. We could end up being friends. 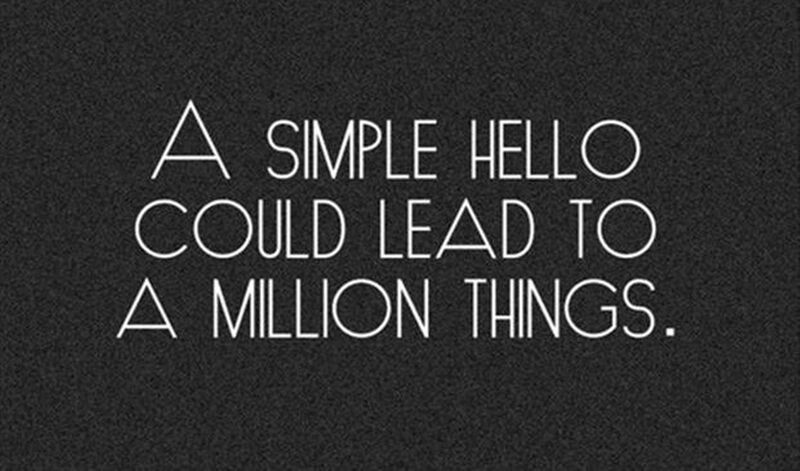 It could be as simple as saying hello. Hello is like life itself it comes with endless possibilities. Hello could be the beginning of heart break, it could be the beginning of an unhealthy friendship it could be the beginning of a lesson you wished you’d never learnt. Every experience in life will teach you something, whether it is something about yourself, your friends, your family hello will have it’s place in that lesson. Don’t be afraid to say hello. Don’t be afraid of the possibilities. You’re never going to be able to prepare for every possibility in life but that is what is so exciting. The hello you say today leads to a life of possibilities tomorrow. Hello. It’s really nice to meet you.